In stadiums across the country, college players are tackling their way from one end zone to the other; coaches are shouting themselves red in the face and inviting heart attacks; and fans are cheering their teams on as violent confrontations take place between the yard lines. Scoreboards show points and yards to go, but there are some other numbers associated with football that have attracted attention of late. An average of 20,718 college football injuries occur each year. The most common football injury is a knee injury; 3,774 happen each year. 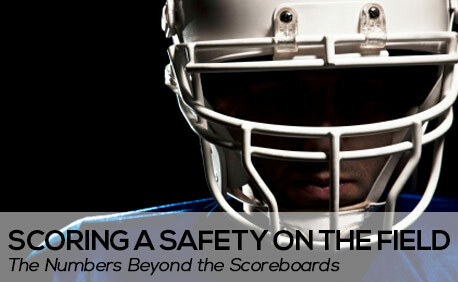 10% of all college football players sustain brain injuries, an average of 1,364 per year. There are an average of 841 neck/cervical spine injuries and 627 lower back/pelvis injuries each year. Football players are nearly seven times more likely to be injured during a game than in practice. Linebackers are injured most often, accounting for 13.5 percent of all injuries. Running backs and receivers follow at just more than 11 percent each. Quarterbacks account for 5.8 percent of the injuries. 7.5 percent of football injuries require surgery. Just a week before the first game of the NFL 2013 season, a class-action settlement was announced, involving a payout of $765 million dollars in settlements and medical care for players who have suffered brain injuries as a result of their time with the league. It awaits approval of a federal judge. The plaintiffs include approximately 4,500 players, including 10 members of the Pro Football Hall of Fame, who allege they developed dementia, depression or other concussion-related brain disorders from violence they endured on the football field and that the NFL concealed the long-term dangers of concussions and rushed them back into play after their injury. Despite the settlement, the NFL does not admit that it hid the dangers of head injuries from players and it won’t have to disclose internal files that might reveal what it knew and when. The growing awareness that concussions can have serious long-term effects has led to some changes in the way the game is played and spurred research into better helmets, for both professional and college football players. According to researchers at Purdue University, a safe limit for hits to the head is around 700 per season, but according to HBO Sports, the average college football player absorbs 1,000 blows to his helmet each season. The Purdue studies found that many football players perform more poorly in mental exams during the season and that dramatic changes occur to the brain as the season goes on. Since 2010, the NCAA has required every school to have a concussion-management plan. A student-athlete who exhibits signs, symptoms or behaviors consistent with a concussion is supposed to be removed from the game and evaluated by a medical staff member. Athletes who are diagnosed with a concussion are not supposed to return to activity for at least the rest of that day. But there is no mandated way on how to diagnose concussions, and many football players choose to stay quiet about concussion-like symptoms to doctors and trainers so they can continue in the game. Some football players are wearing high-tech helmets designed to measure and prevent head trauma. Since 2003, Virginia Tech players have worn helmets with sensors to measure the number of hits they take and the severity of them. Every time a player has a head impact that exceeds 98 Gs — or 98 times the force of gravity — the information gets transmitted to a sideline computer and team medical staffers are alerted by pager so they can look for signs of concussion. Dartmouth, Brown, North Carolina and Oklahoma have started using the Head Impact Telemetry (HIT) System, which costs around $50,000 to $60,000. Former Buffalo Bills safety Mark Kelso was ahead of his time 20 years ago in dealing with concussions. He wore an additional layer of foam padding on the outside of his helmet for the final five years of his career. Today Kelso is an advisory board member for the company which makes the Guardian Cap, a one-size-fits-all soft shell that covers the helmet on the outside. They say it reduces impact to the head by 33 percent but adds only .31 pounds of weight to a four- or five-pound helmet. The University of South Carolina Gamecocks started wearing Guardian Caps during preseason football practice. South Carolina tried 32 of them on linemen in the spring, liked them and bought 75 more to go team-wide for practice, but they’re not using them on game days. Several other impact-monitoring systems have been developed: Riddell’s InSite Impact Response System includes a sensor pad in the liner of the helmet that transmits when certain impact levels are exceeded to a handheld “alert monitor” on the sideline; X2 Biosystems of Seattle has the X-Patch, a small, sensor-equipped patch to be worn behind the neck; Reebok’s CheckLight has an impact sensor in a skull cap which causes a light to flash yellow or red when impacts meet certain thresholds, and it displays how many hits occur in practice or a game. Improving the safety of college football players is going to require a committed effort by coaches, players, regulatory agencies, college administrators, researchers and sports equipment manufacturers. It might be true that the fans and alumni deserve an exciting gridiron challenge, but young athletes deserve the chance to lead long and healthy lives after they hang up their jerseys. We applaud the research being done and the NCAA newly adopted rules seeking to make the sport safer. To read about traumatic brain injuries and high school sports, read our blog about the incidence of TBI in teens.